The Manchester four-piece are one of the most brilliant – radical, even – rock groups this country has ever produced. Who says so? John Lydon, for one, hailed 10cc’s genius. And Trevor Horn for another; the super-producer might not have been able to effect his sonic changes without the giant leaps that 10cc made at their Strawberry Studios in Stockport between 1973 and 1976, when they did their best work. It’s strange to consider that this most 70s of bands, steeped in state-of-the-art technology, postmodern peers of Bowie and Roxy Music, as smart as Sparks and Steely Dan, had a pre-history in the 60s. Graham Gouldman was a songwriter for The Yardbirds (For Your Love, Heart Full Of Soul), The Hollies (Bus Stop) and Herman’s Hermits (No Milk Today). Eric Stewart had been a 60s heartthrob as lead singer of The Mindbenders. By 1970 Stewart had joined forces with art-school brats Lol Creme and Kevin Godley to form Hotlegs, who had a UK No.2 (and worldwide) hit with Neanderthal Man. With Gouldman back in Britain, the four enjoyed a brief tenure as Neil Sedaka’s backing band in the early 70s, when they realised it was time to record music of their own. The results were unique, the next logical step after Abbey Road, only instead of a Lennon & McCartney-style dominant partnership, all of 10cc could sing, play various instruments and produce (with Stewart their own George Martin). They also wrote in several permutations: Gouldman and Stewart were purveyors of perfectly crafted pop-rock and beautiful anti-ballads; you may be familiar with I’m Not In Love. Meanwhile, Godley and Creme’s songs were zanier. But Creme-Stewart compositions such as Life Is A Minestrone had a comic daring all their own, Creme-Gouldman wrote the ingenious The Worst Band In The World, and Stewart-Godley offered deft rocker Oh Effendi. Or they might all join forces and create a Zep-heavy monster like The Second Sitting For The Last Supper. “They’re the Beach Boys of Good Vibrations, the Beatles of Penny Lane… they’re sheer brilliance,” Melody Maker wrote of 10cc’s second album, and it was no overstatement. This was 60s pop given a 70s technological lustre by four men who knew their way equally well around a chord change and a studio console. Sheet Music is a classic of smartness and concision, compressing an array of styles into its 10 tracks, from anti-capitalist rant The Wall Street Shuffle to a song about an aeroplane bomb (Clockwork Creep) and a Technicolor epic about Marilyn Monroe (Somewhere In Hollywood). Music for the eyes and ears. From its Humphrey Ocean-pencilled cover image to its songs about Christ’s no-show, pornographers and drug dealers, 10cc’s third album was a darker affair than its predecessors. That noir tone extended to the three-part tale of prostitutes and murder in the French capital, Une Nuit A Paris, an eight-minute mini-operetta that surely influenced Queen’s Bohemian Rhapsody. Then there was production landmark I’m Not In Love, arguably the most twisted love song ever to reach No 1, and, with its revolutionary use of looped, layered voices, a signpost for 10cc fans such as Trevor Horn to follow. Eighties pop began here. The balloons-and-bombs logo providing the central image on their debut album’s sleeve superbly captured 10cc’s cartoon logic. It’s a sensational showcase for their skills, including doo-wop pastiche Donna, rock’n’roll revisit Rubber Bullets, early-60s pop homage The Dean And I and revenge-of-the-nerds anthem Sand In My Face. Elsewhere 10cc rail against the Fourth Estate (Headline Hustler) and driving too fast (Speed Kills), although the latter could easily be about amphetamines, such is 10cc’s ambiguous wit. The fact that they were charting – high – with this stuff was testament to their subversive ingenuity. The last album by the original four didn’t scale the giddy heights of its predecessors, and instead of madcap glee there is a fin-de-siecle feel to 10cc’s satirical pun-gency, from the weary sexual subtext of Head Room to the ‘dumb waiters waiting, sweating, straining/All mass-debating my woman‚’ on Don’t Hang Up. Still, a lacklustre 10cc was worth most bands at full throttle, and their melodic invention and prog-pop penchant for switching styles and tempos were present on I’m Mandy Fly Me and Art For Art’s Sake, while I Wanna Rule The World crammed several albums’ worth of ideas into four minutes. 10cc split in 1976, giving us the art-school axis (Godley & Creme) and the professional songwriter wing of Gouldman and Stewart. The latter, retaining custody of the 10cc name, emerged as the commercially viable partnership with Deceptive Bends, including The Things We Do For Love and Good Morning Judge, possessing the pizazz of yore. The album even had its own G&C-style tripartite song suite in Feel The Benefit Pt 1-3. People In Love was a lachrymose ballad too far for Godley, prompting his and Creme’s departure long before the album was recorded, but Honeymoon With B Troop proved Stewart and Gouldman could do quirky too. Consequences found Godley & Creme at the furthest extreme from their former bandmates. A triple box-set concept album concerning ecological disaster, with narration by comedian Peter Cook and a cameo from jazz singer Sarah Vaughan? Hardly surprising that Godley had baulked at the banal limitations of People In Love. Consequences was an audacious quasi-musical with avant-garde elements. Some of it was accessible, but G&C insisted on adding random noise bursts to it. Still, there were tracks that proved their pop sensibility was intact, albeit surrounded by acres of demented experimentation. 10cc: "I love all our albums, but that one has the edge"
For those who’d been following the band members’ story since the 60s, the Gouldman-Stewart iteration of 10cc will have been manna from heaven, with the focus now on traditional songwriting verities. Gone, largely, were the manic zips between tempos/styles, replaced by a more measured, mellow MOR approach. Bloody Tourists did have its wry moments – Dreadlock Holiday being the obvious example – and there were bursts of pop absurdity such as Shock On The Tube (Don’t Want Love), but it was mainly adult easy listening, with signs that our heroes were becoming increasingly estranged on solo writing forays. The job of maintaining 10cc’s reputation as the brothers of invention was left to Godley & Creme, who with their second album produced a pithy showcase for their wayward talents with a single, 30-minute LP. There were no conceptual digressions, just pop songs. Or songs-within-songs: This Sporting Life featured a Zappa-esque collage of fragments. Hit Factory/Business Is Business suggested they’d been scarred by the hostile reaction to Consequences, but elsewhere fun was on the menu, such as the playful doo-wop of Art School Canteen. If L sounds like two art-school kids running amok in the studio, that’s because it is. On their third album, Godley & Creme came across as peers of the new-wave art-punk brigade. The title track was mutoid funk that name-checked the early 10cc (when they were called Hotlegs) hit Neanderthal Man. 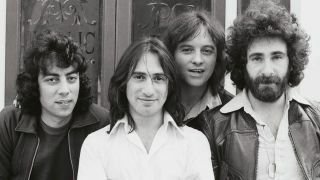 With their referential, postmodern techniques, 10cc were more precursors of the sampling age than they were remnants of the Merseybeat era. And G&C picked up that mantle admirably here. On I Pity Inanimate Objects, all voices and instruments are tweaked and treated. Marciano is pristine proto-electronica. Guest guitarist Phil Manzanera described G&C as the two smartest operators he’d ever worked with, Eno included. ### **Look Hear? (1980)** With its Hipgnosis artwork making capital (letters) of the phrase ‘Are You Normal?’, you could have been forgiven for assuming there might be a return to playful, peculiar 10cc on their seventh album. Instead it’s awash with sensible songwriting, the corollary, perhaps, of a band, previously fearless, responding cautiously and conservatively to changing market conditions. Look Hear? was full of middling rock, cod-reggae, lifeless ballads, and pop without any of the irresistible choruses or prankster attitude of yore. The same, sadly, can be said of any of the remaining albums bearing 10cc’s name, from 1981’s Ten Out Of 10 to 1995’s Mirror Mirror.